Nearly two weeks after Hurricane Maria slammed Puerto Rico, much of the island is still at a standstill. But at a defense factory outside San Juan, 330 employees reported for work on Tuesday determined to rebuild and restart. Bluewater Defense produces U.S. military combat clothing. It employs 560 workers, 95% of whom are women. 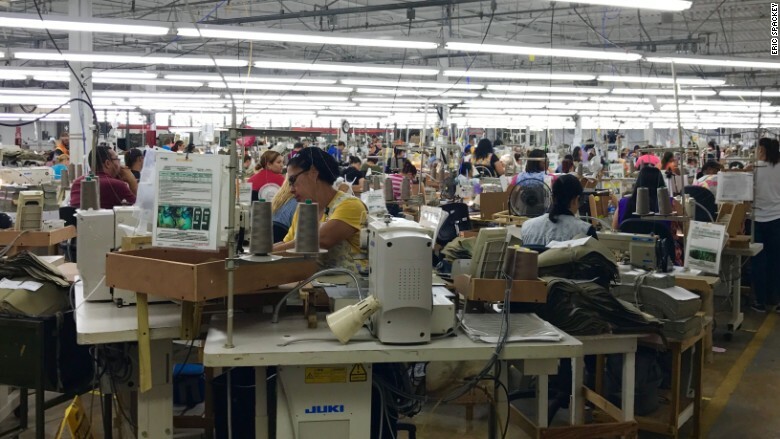 All of its production is done in Corozal, Puerto Rico, a 30-minute drive from the capital. Three days after Maria made landfall, 100 of its workers showed up and started cleaning up the damage left by the storm. The number swelled to 200 in five days. 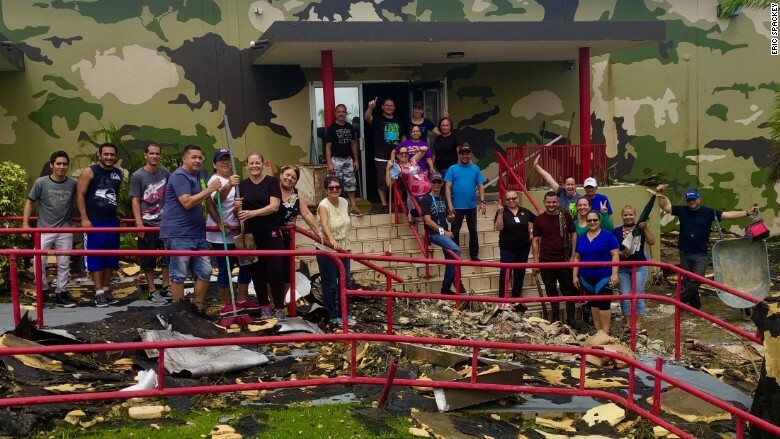 Three days after Hurricane Maria struck, 100 of its workers showed up to clean up the destruction at Bluewater Defense's factory in Puerto Rico. Bluewater Defense's production is spread out between five building on the factory campus. Three are badly damaged. "The roof was peeled off, floors were flooded. Our automated machinery has water in it," said Spackey. Thousands of pairs of combat pants ready for shipping were soaking wet and needed to be dried out in the sun. "My guess is this is $2 million in damage," said Spackey. But he isn't dwelling on the cost. He's stunned and grateful his workers showed up ready to rebuild. Employees have helped sweep and mop and move all the salvageable equipment into one building, he said. "One building is fully operational now and we're using half of another," said Spackey. 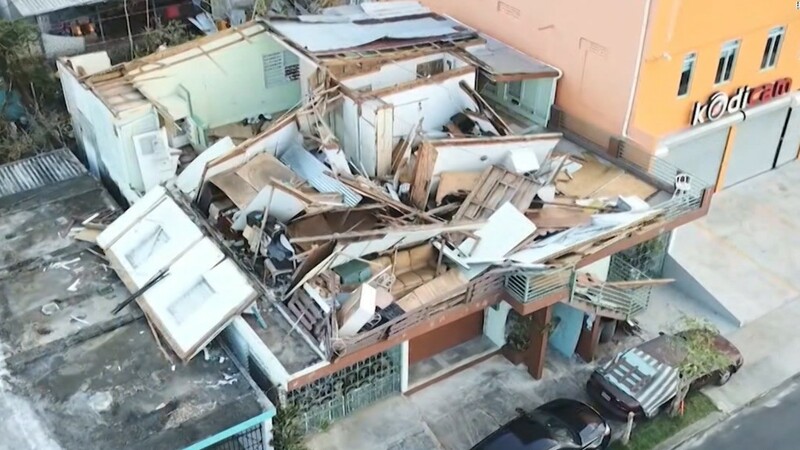 Damage to the factory caused by Hurricane Maria. With no electricity on much of the island, Spackey is operating the factory with three diesel generators at a cost of $3,000 a day. "It's not sustainable in the long run," he said. As of Tuesday, two-thirds of production is up and running. By Friday, he expects to be making up to 2,600 items a day, close to the daily production target pre-Maria. "Most people in their situation would stop functioning after what they've been through. But my workers are here, working, helping me and each other," said Spackey. With the U.S. territory still struggling with shortages of food, water and gas, many of his employees are sharing fuel to ensure their coworkers are able to get to work. Spackey, who lives in Puerto Rico, rode out Maria with his wife and daughter in his house. "I didn't want to leave. I have 560 people and their families relying on me," he said. 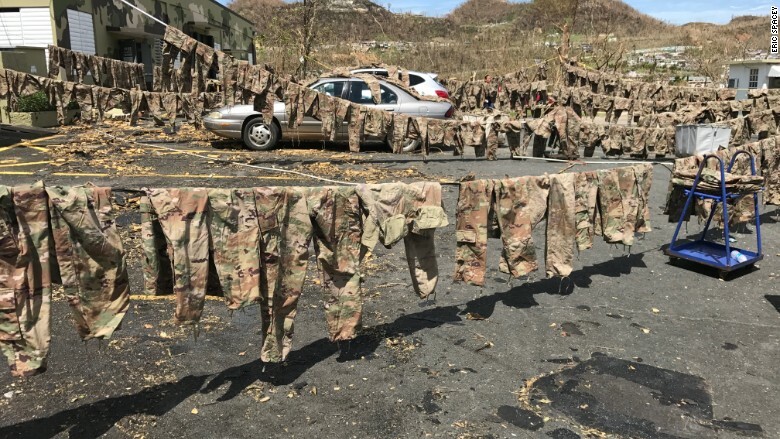 Thousands of army combat pants were soaked when Hurricane Maria tore off the roof of Bluewater Defense's factory building. 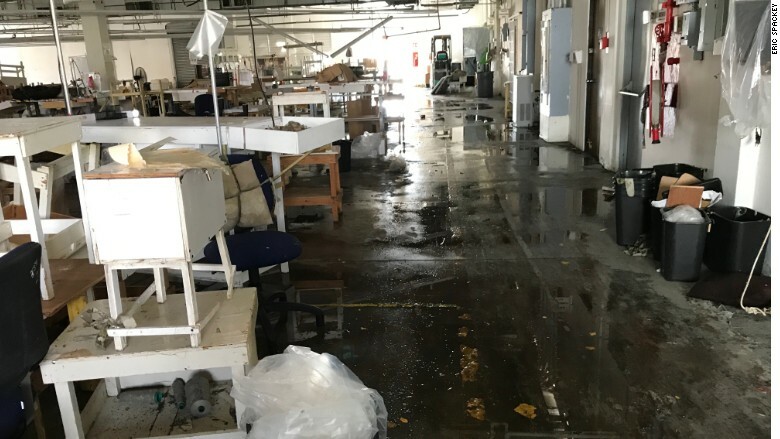 Because of lack of running water, Spackey has installed a couple of portable bathrooms around the facility and is providing employees with drinking water and subsidized food cooked on the premises. Spackey is also paying everyone who shows up to work their normal wages. At the same time, banks in Puerto Rico are either closed or running low on cash. "I wish I could take out cash for all employees because they desperately need it. But we pay $200,000 in weekly wages. I just can't do it under these circumstances," he said. 330 of 560 workers at Bluewtaer Defense are back at work. When he can, he is giving cash to the most desperate. "We're also organizing clothing and food drives on our campus," he said. He's reminded of one worker -- Carmen -- in her mid-60s. "She's divorced and lives alone," said Spackey. "She's distraught. She lost all of her clothes, everything. She came to work to get some routine, some normalcy back in her life." By next week, Spackey is confident production will be at 100%. "I can't say enough how proud I am of our employees. They restore your faith in humanity," he said.